Wes Durston had the Foxes on the run when he demolished Leicestershire’s bowling to lead Derbyshire to a 17-run victory in the NatWest Blast T20 North Group at Derby. The Falcons T20 captain blasted four sixes in his 88 off 49 balls, Derbyshire’s sixth highest individual score in the competition, as the home side ran up a daunting 189 for 7. Although Tom Wells smashed an unbeaten 64 from 25 balls and Foxes skipper Mark Cosgrove hit 44 off 33 balls, no one could match Durston’s explosive strokeplay and Leicestershire ended well short on 172 for 7. Tillakaratne Dilshan was making his last T20 appearance for Derbyshire before leaving to play in the Caribbean Premier League but he lasted only six balls before he chopped Ben Raine onto his stumps. Atif Sheikh bowled three wides in the first four balls of the match and his line did not improve in his second over as Durston drove and cut him for three fours in five balls. Durston dispatched Rob Taylor’s first ball over long on onto the pavilion roof and pulled the next one over midwicket for six before driving the last ball for another boundary. Chesney Hughes lofted Jigar Naik’s second ball for six and the pair had added 71 in seven overs when Hughes was well caught by Wells diving forward at long off for 20. But Durston was the big threat to the Foxes and after he reached 50 off only 28 balls, he pulled Wells for a huge six over midwicket as Derbyshire moved to 98 for 2 at the halfway stage. Although Sheikh had Wayne Madsen caught at midwicket, the over cost 19 as Durston lifted the last ball into a car park but when he tried to drive Raine for his fifth six, he failed to clear long on. Alex Hughes drove consecutive Taylor deliveries for six and although Raine conceded only five from the last over, Leicestershire faced a testing chase which Cosgrove launched by flicking Nathan Rimmington over square leg for six. 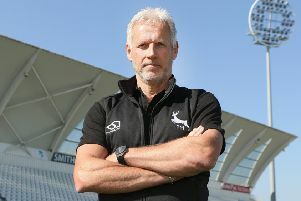 Ned Eckersley was caught behind down the leg side off former Leicestershire seamer Wayne White in the fourth over and although Raine drove Shiv Thakor for six, he was stumped charging Durston in the eighth over. Cosgrove responded by driving Dilshan for six and four but the Foxes went into the last 10 overs needing 108 and their hopes took a big blow when the skipper was caught at deep backward square off Alex Hughes. With no boundaries for three overs, the pressure was building and it accounted for Umar Akmal who was run out going for a second by Madsen’s throw from deep midwicket. Wells pulled and cut Thakor for consecutive sixes but Niall O’Brien was well caught on the run by Durston at deep mid on and a target of 67 from the last four overs proved too much as Derbyshire ended a run of three straight defeats. Durston said: “We defended that total very well and any win in this division is a good win and Leicestershire are playing some good cricket at the moment.